this past week was much less eventful than the week before it. my power has continued to stay on. there are a few people where i work still without power at home, but most of the people i know have power again. there are a bunch of traffic lights not working — either off completely or flashing. it has made getting to work and home pretty crazy for most people i think. fortunately i don’t have too far to go, and i work 9ish to 6ish so i miss the worst of the traffic anyway. the lawn crew was scheduled to come by sept 12th but didn’t happen, seeing as there was a hurricane and all. they ended up coming the next friday (19th), which i hadn’t expected, and cleaned up a fair bit of the leaves and small sticks. 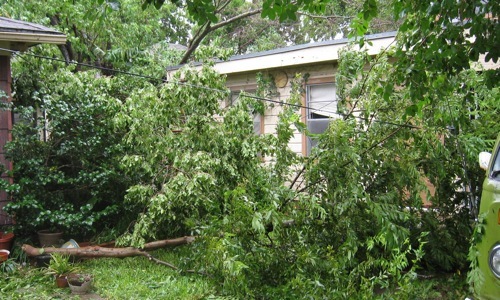 the big limbs and small tree were still there, so i called jack to borrow my electric chainsaw. he ended up coming by and cutting up most of it while i was at work. he left behind a few bigger pieces. i got him to leave me the chainsaw so i could finish up. then friday when i got home from work everything was cleaned. the lawn crew had come back on their normal scheduled day. this just further proves that laziness pays off. i did go out this morning and cut down a big dead limb that has been resting on the roof of the apartment behind the house. after spending about an hour doing that, i remembered that i don’t really ever do any physical labor or ever spend any amount of time out in the sun. friday morning (yesterday) i decided i would take the bel air to work. i moved the pickup onto the street, then hopped into the bel air. but when i was backing out of the drive something didn’t feel right. i got out and walked around to the passenger side and the front tire was completely flat. i don’t know when or how that happened. i guess i have to find a shop that repairs tires now. i got my other order i’d made awhile back. i ordered a couple of things from the website for the band cake. i bought a gas bird coffee mug (such a cute and courteous little death-dispensing bird! it’s the one on the cd tray insert for b-sides and rarities…and that one smells like gasoline if you scratch it.) and a cake crown t-shirt. seeing as i was looking for a xxl, my choices were extremely limited. fortunately, the shirt i got was one of the few i liked a lot. the pig hoodie is pretty nice, but i don’t wear hoodies much. these interviews are brilliant! those spudboys were intelligent and subversive. what a great combination. he’s a man with a plan. his finger is pointed at devo. now we must sacrifice ourselves, that many others may live. upon finishing my last entry, i left the house to meet the potts at goode company bbq for lunch. when i opened the back door — as if on cue — a beautiful large butterfly came around the corner of the house and gracefully flapped and coasted its way a couple of feet off the ground right in front of me and went around the other corner of the house. it was like some sort of scene from a movie or something — a cheesy visual from a hack storyteller portraying how my mental fog had lifted and the world was in balance. except it really happened. i took this past friday off from work because i was basically in an emotionally drained zombie-like state, shuffling along from place to place with little feeling or thought. i got a few offers from various people to hang out and/or stay with them. by friday night i decided maybe i should. i had to force myself to get up the energy to pack a few things, get outside, and drive. i went over to the potts and we watched what appears to have been a bootleg copy of wanted. i say that because a lot of the titles and some text in the movie were in cyrillic. (at least it appeared to me to be cyrillic.) the movie was like the child of a wu film and fight club, heavily filtered through the matrix. but with all of that wonderful genetic material, it still came out a loser. beautiful at times? yes. some cool sequences? yes. some witty dialogue here and there? yes. angelina jolie? yes. but overall: eh. i slept at the potts, then spent saturday until around 6pm with jack and the kids. from there i went over to jamie’s (amateria) place. i hung out and met her dad and his wife, did some things to try and finish setting up her wi-fi and getting her daughter’s desktop online, and ate supper. (she’d already done most of the hard stuff with the wi-fi and router. i just had to play with things a bit to get everything more finalized.) i stayed until around 11pm and then headed back to the house. which had no power. yes, four of kubrick’s classic movies, all remastered and attached to a bunch of new extras. and all in 1080p. yep, the criterion release of bottle rocket. it doesn’t come out until november, but i went ahead and pre-ordered. and i decided to go ahead and step up to blu-ray. i guess i’ll have to get a blu-ray player and a tv that can display high-def by then. i’m not a gamer, but i’m considering a ps3 instead of a traditional blu-ray player. i don’t know. hhmmm…of the six movies i got, five contain mental destruction or breakdowns of some sort of another as a major plot point: jack nicholson in both the shining and one flew over the cuckoo’s nest, hal in 2001…, the cadets in full metal jacket, and alex in a clockwork orange. the only exception was before sunrise, which is a tale of meeting a romantic soulmate but only having until sunrise before you must part ways. maybe that butterfly wasn’t just random chance. around 9:30am this morning i was laying in bed, when suddenly the floor fan came on. my brain, in its addled state, thought “hmm, that’s interesting. i haven’t heard that in a while.” then, suddenly, it hit me: the power just came back on! i waited 5, 10, 20 minutes before telling anyone else or believing it myself, because i didn’t trust it’d stay on. i’m still eyeballing it cautiously, but i’ve had electricity for about 3 hours now so maybe it’s there to stay. about 30 minutes ago i finally turned on my powermac. which is how i’m posting this. the past 8.5 days without electricity has been a weird and somewhat surreal trip. which is hopefully over as pretty much everything should be back to normal for me now. it’s surprising how much it affected me. at least i assume being thrown out of my routine and not getting good sleep and not being able to do any of the things i like to do (music, movies, computers) is what did it to me. more on everything later. Author TeRRYPosted on 21.September.2008 @ 12:30 2 Comments on i’ve got the power. no power again. it gives me the opportunity each night to relive the losing/erasing of memories sequences from eternal sunshine of the spotless mind — the blue-white circle of an led flashlight partially and disjointedly illuminating bits and pieces of once familiar objects from my past that are now in the dark. except when I wake up in the morning, all of the objects and memories are still there instead of erased. and the next night I get to repeat the experience. here are a couple of pics taken during the live broadcast I was doing on ustream.tv Friday evening from the top of a parking garage in the medical center. thanks to glimsmack for capturing the images for…uh…posterity…I guess. well, at least we were entertained. last night I had a few shots of patron, wrote a few pages of thoughts in the dark, and then fell asleep. the temperature was nice – even a bit cool – but I still didn’t sleep that well. we were supposed to go to work today, so I dutifully went. not much of anything got accomplished, although we did get to compare hurricane experiences. most people seemed to think they had had enough of a hurricane experience. I, however, still wanted more. (they seemed to find that odd or perplexing.) the company provided free pizza for lunch. at the end of the day, i left work and came home, took a nap, then went and ate at the house of pies. now I’m home again. still no power. so this is from my iPhone. i’m still without power. sleeping on the porch last night was pretty nice, since the cold front came in. it was nice today as well, and should be nice for the next couple of days. I ended up going over to Methodist cafeteria yesterday evening before leaving the medical center area. it was good to get a warm burger. I got up today around 10am I think. I’d charged up my iPod at work last night, so I laid on the porch and listened to music with the headphones. I took a warm shower (my water heater is gas) and got on my motorcycle. I saw a few places with long lines and still a lot closed. I ended up eating at cleburne cafeteria. chicken fried steak, mashed potatoes and gravy, cooked carrots, cucumber salad, Texas toast, and an iced tea is not exactly roughing it. I went back home and stayed at the house awhile, then a co-worker who lives in pearland asked me if I wanted to meet him at his house. it had some wind and rain damage. I took my camera and iPhone and iPod. he didn’t have power, but while I was there the power came on. I charged my electronics and watched some tv, then headed back home. I was home for awhile, then decided I’d try to get something to eat. I drove around, but places seemed to have long lines, and a couple of places I thought of going that I figured would be open weren’t. I finally stopped at the hobbit, but when I walked in they said they were already closed for seating due to the curfew. so I gave up and went home. so now I’m eating some pretzels and cookies and drinking some water. I also have a 750ml bottle of patron silver I think I’m going to investigate. no wonder people used to smoke and drink all the time back in the olden days. there isn’t much else to do after the sun goes down if you’re by yourself. last night i got home and had no power, so around 12:30am i decided to see if i could find some place to get something to eat, or maybe get a cold drink. i ended up driving from shepherd down westheimer all the way to fondren, took fondren to richmond, then richmond all the way back to shepherd. there were very few places that had power along the way, so most of the traffic lights and street lights were out too. one of the only places that had a bunch of people was a cajun place at the railroad tracks on richmond, and it was full of cop cars. if i liked cajun food i might have stopped, but i also wondered if it was being used as a rally point for the police. (or maybe the cops just all knew it was one of the only places open.) i got back home around 1:30am. i spent the night on the porch. it was a little warm and there was no wind, but then sometime in the middle of the night i was awakened by a downpour. that cooled things down. except it kept raining. today there’s been flooding around town because of all of the rain last night. i got up at some point this morning and slept on the bed some. it should be cooler tonight though, and probably no rain. that will help all of the people without power. i got up around 10:30am and decided to walk around. i walked probably around 20 blocks or so. i only saw about 3 places that were open (a couple of convenience stores, and a mexican food restaurant i don’t like). when i got back home, i grabbed a cigar and a book and sat outside and smoked and read for awhile. while i was out there, i talked with a couple of guys cleaning the yard across the street. it turns out one of them owns an old car, works at nasa, and grew up in san angelo. that was kind of cool. i drove into work around 12:30pm today. (which is how i am able to post this.) i needed to take care of some work-related stuff, which i couldn’t do from home since i don’t have power. i also needed to charge some electronics. and i wanted to have the chance to eat something warm. there were a lot of lines at gas stations that had power and were open. fortunately, i had filled the tanks on all three of my vehicles, so i should be good for awhile. houston has instituted a curfew at 9pm, so i’ll probably head home and hang out at home again tonight. i may see if i can find some place to get a warm meal before i lock myself away for the evening. i drove down near the water covering 288, took a couple of pics, then turned around and went the wrong direction back up the on-ramp to macgregor. the mini-van and another vehicle had gone on the wrong side of almeda to get around the fallen tree, but of course as i was going around traffic came toward me. and even though it’s 3 lanes, someone was in the lane i was in. i just sort of kept driving and assumed they wouldn’t drive obliviously like the mini-van driver. fortunately, they saw me and switched lanes. i took the opportunity of an opening to hop back onto the right side of the road, and that’s when i came up on the fallen light pole i showed earlier. i left the “work bunker” around noon today and headed to the house to see what if anything had happened. here are a few pics of what happened at my house. it’s really not all that impressive. 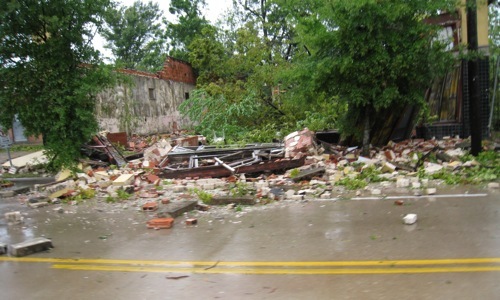 of course, that doesn’t compare to the many full fallen trees i saw while i was driving around. a small tree (probably about a 4 or 5 inch trunk diameter and maybe 15 feet high) had fallen over and pulled the phone line. but the phone was still working. then a big branch (probably about 8 inches at the base and maybe 20 feet long) had ripped off of a tree and fallen on the cable line. but it was still intact. (not sure if it was working, since i didn’t have power.) fortunately, neither of them fell on the power line. and neither of them actually broke the line they fell on, as far as i can tell. i got out the lopping shears (is that what they’re called) and cut off branches until they were no longer laying on the lines. i didn’t see any interior damage, other than maybe a bit of leaking in one spot in the ceiling where it has leaked some in the past. but it was very minor and didn’t appear to be any kind of problem at all. hurricane webcam failed. or did it? i got up this morning a little earlier than i’d planned. i started stopping apps before i left to help keep the usage low on the powermac — so it of course immediately locked up. i had to reboot it at that point, so i went ahead and installed updates and rebooted some more. i set the cam and the music going and left for work. once i got to work, i started… “working” you ask? no, setting up a med center cam, of course. then around 6pm my cam at home went dead. i was curious if the power went out or something had happened, so i decided to drive to my house. and also pick up some folding chairs. while on my way out, a security guy sort of started grilling me a bit. 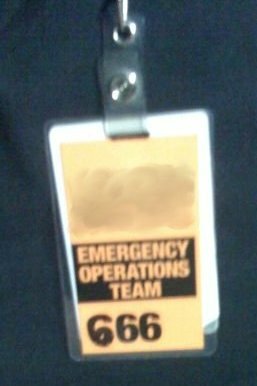 then he saw my essential personnel badge, which i’d modded from “66” by adding another “6” in sharpie. a co-worker went home with me and we picked up the chairs. sure enough, power was out at my house. my block and a few around it are horrible about losing power. how bad? i lost power for an hour during the last hurricane. by “last” i mean gustav. which was nowhere close to here. no other areas around us lost power. anyway. the power was out, so i grabbed the cam and brought it to work with me. once back, a few of us went up to the top of the attached garage and i started doing live broadcasting. then a few more people showed up. in total, there were 7 of us. i was getting pretty crazy and acting stupid. 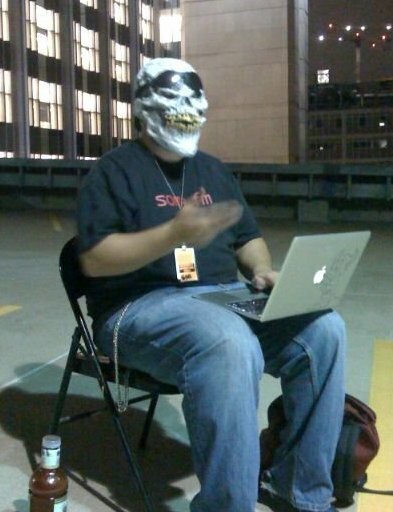 i was sitting in a folding chair in the middle of the top garage floor talking to my macbook air while wearing a skull mask and goggles, and everyone else was standing around laughing and making comments. then someone else walked up. it was the security guy from earlier. evidently someone from another business had called and said there were a bunch of people doing something on the top of the parking garage. the elevators are turned off, so he had to walk up the stairs to check it out. fortunately, he thought it was pretty funny. he pulled out his camera phone and took some pics, and was telling people on the walkie-talkie they needed to see what was going on. a bit later another security guy showed up. we all sat around and joked for awhile, then they left. we were being pretty stupid and reenacting internet memes and such. it was funny. and there were quite a few different people i knew watching the stream at that point and making comments in the chat channel. since then, about the only thing i’ve done is a few more short live broadcasts, and went outside for awhile with a couple of guys and smoke a cigar. oh yeah, the hurricane. not much has really happened here. some wind, very little rain. i guess it’ll get worse over the next hour or two, but i may very well be asleep. i’ve eaten way too much junk food. Author TeRRYPosted on 12.September.2008 @ 23:29 1 Comment on hurricane webcam failed. or did it?